I broke up with winter in January 2014. It was a toxic relationship that should have ended long before that – but better late than never! Moving from Michigan to someplace warm was a dream I’d had since oh, about the age of four. That’s when palm trees and beach scenes became a recurring theme of my childhood drawings. So, twenty-six years later, I up and moved to Florida. It took me less than 24 hours to fall head over heels for Sarasota AND become a certified beach bum. But, not your regular, lay-on-a-towel-and-tan beach bum. I’m more of the explorer type, which often involves walking for miles to experience the entire shoreline – beyond the spots with all the lifeguard stands, swimmers, and sunbathers. And, after three and a half years of living in this paradise, I’ve walked almost every single Gulf coast beach between Tampa Bay and Charlotte Harbor. Does this qualify me as a beach expert? Prolly not. But I can still offer up my own beach guide, right? I first attempted to rank these beaches – from Tampa to Boca (Grande) – but there were sooooooo many ties that I gave up. Instead, I decided it would be more helpful to just run down the coast, starting with the northern tip of Anna Maria Island (AMI for you cool kids). This way, you can do your own ranking, based on my descriptions and your own personal preferences. 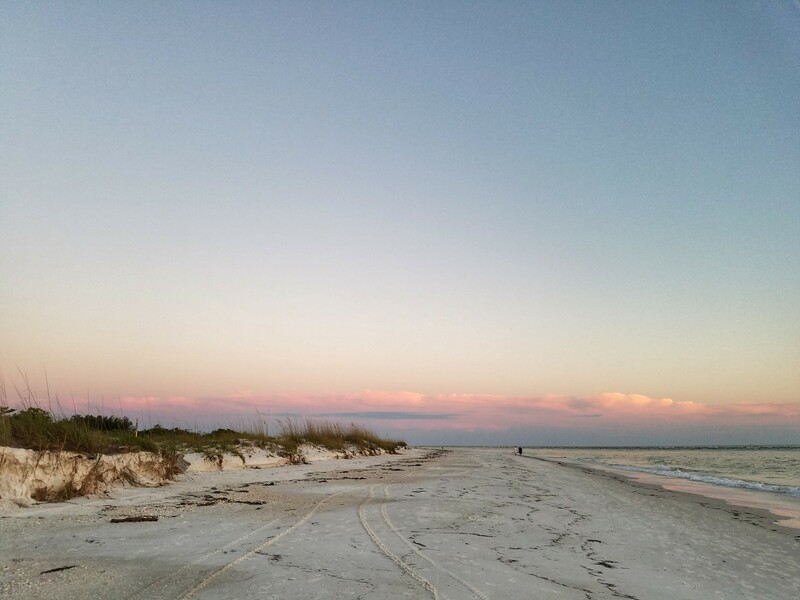 Located at the tippy top of Anna Maria Island, this sandy shoreline also serves as the southern sentry into Tampa Bay from the Gulf. Come hungry – for views AND food! Rod & Reel Pier juts off the northeast side of the point, offering over-the-water dining with the majestic Sunshine Skyway Bridge fully visible across the Bay. Holmes Beach stretches south from Bean Point for a few, walkable miles along the Gulf. Take a stroll or claim a spot for your towel and umbrella. And there’s food here, too! The Anna Maria Island Beach Café features a deliciously casual menu, tiki bar, and even a gift shop – for all those kitchy, colorful beach souvenirs you really don’t need but still must have. Moving south, Holmes transitions to Bradenton Beach, distinctive for its three concrete piers. Though the island is quite narrow here, the beach makes up for this in length. And, with street parking and small, bayside rental properties lining the entire length of beach, there’s less congestion in any one spot. 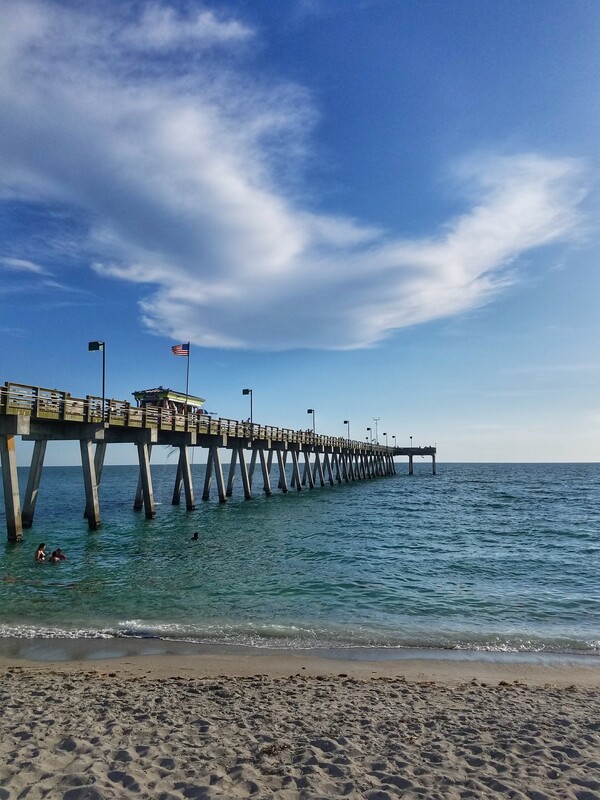 Fun fact: Bradenton Beach is just across the bay bridge from Cortez Fishing Village – one of the last remaining fishing villages on Florida’s Gulf Coast. Established in 1880, this place is the ‘reel’ deal. 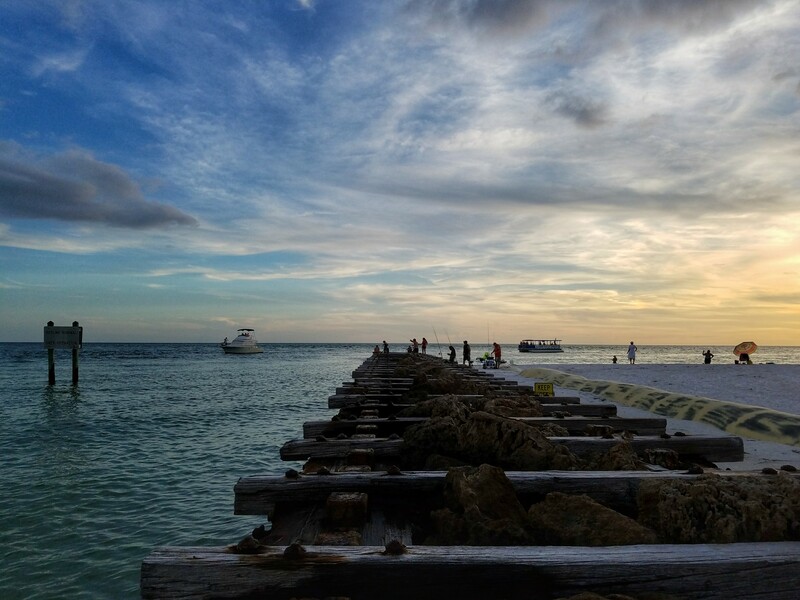 At the southernmost tip of Anna Maria Island, Coquina Beach is marked by a (rather bumpy) parking lot, a beach café, picnic pavilion area, and – my fave part – a wooden, rocky jetty that reminds me of railroad tracks. It’s also pretty popular with the fishing crowd. Cross the Longboat Pass drawbridge (southbound), turn right at the second drive, and you’ll find yourself in the Longboat Public Beach parking lot. Thanks to limited parking and condos vs. hotels, this spot is relatively quiet. Take the boardwalk to the shore and check out the pier. But don’t stop there. The true gem is the northernmost point of the key, known as Beer Can Island. To get there, keep walking north either along the shore (if the tide is low or you don’t mind a little salt water on your shorts) OR through the mangrove trees. 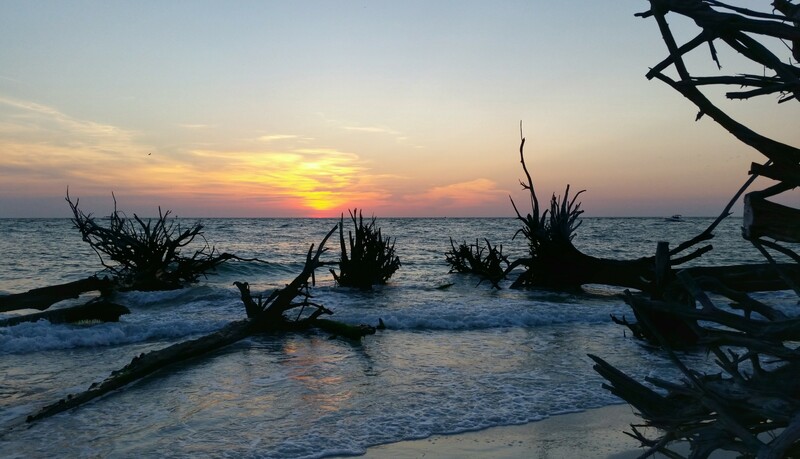 You’ll know you’ve arrived when you see ALL the dead trees – many fallen right into the Gulf. It’s part ghostly, part grand. Bring a hammock. Pitch a tent. Snap some splash shots. Stay for sunset. Beer Can Island is becoming increasingly popular with photogs, boaters, adventurers, and beach bums. But don’t let that deter you. Its limited accessibility ensures that it won’t be completely overrun with tourists OR locals. 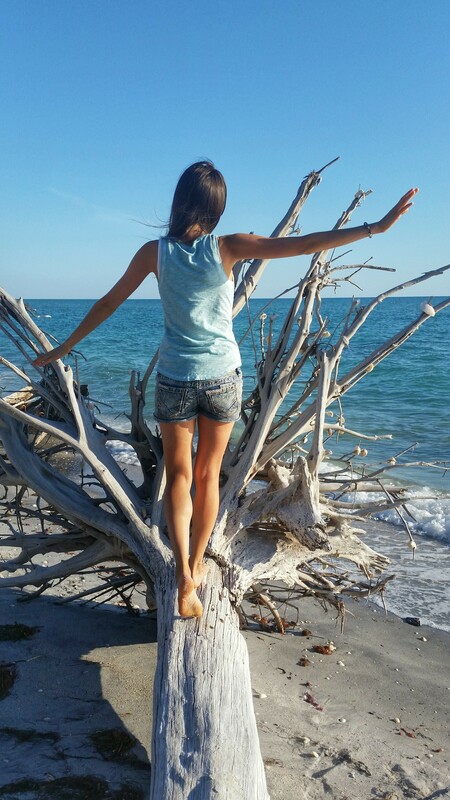 Lido Key is the lesser known of Sarasota’s two barrier islands – and I’m okay with this! Though still quite popular, Lido has a softer presence. An entire stretch of North Lido is completely void of homes, condos, and hotels, making it especially peaceful and perfect for exploring! Lido is my go-to when I’m experiencing major beach withdrawals. The middle portion of Lido is where you’ll find all the condos and hotels + a jetty, beach café, and tiki bar. Nearby St. Armand’s Circle also draws many to the beach for a post-shopping or dining look-see. At the south end of the key, South Lido Park is a prime spot for picnickers, boaters, and fishing enthusiasts – though still more secluded than the main portion of the beach. It’s also the south end that offers kayaking through the mangroves, so if that’s your thing, go here. America’s #1 beach stretches for several miles along the north end of Siesta Key. With its white quartz sand (that will never burn your feet! 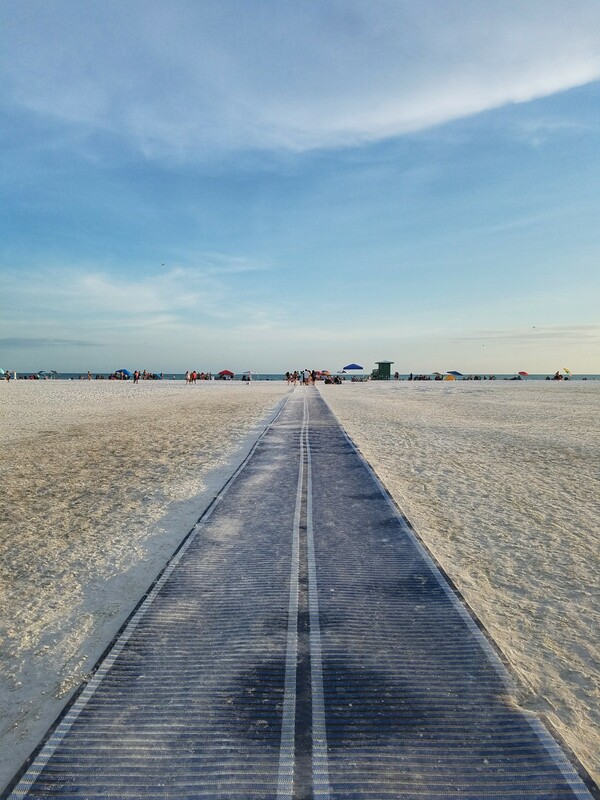 ), endless line of beach resorts, and newly renovated facilities and expanded parking lot, it’s not hard to see why Siesta Beach is deserving of its title. A Sunday night drum circle and vibrant Siesta Key Village also makes this beach a hotspot – especially during Spring Break (when I personally avoid the Key like the plague). Be prepared for slow-moving traffic and 30-minute trolling for a parking space if you do brave the Spring Break frenzy. At the south end of the key, Turtle Beach is vastly overshadowed by renown Siesta Beach, but also draws a crowd due to its campground and adjacency to Siesta. In fact, it’s just as impossible to find parking here during peak season. But, the vastly smaller parking lot and limited vacation properties ensure it’ll always be a quieter alternative to Siesta. 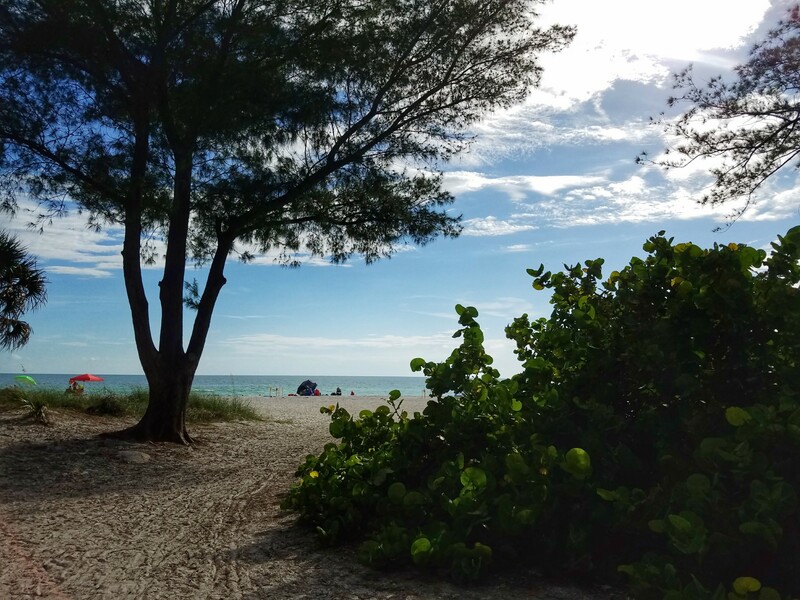 The sole beach on Casey Key, Nokomis often flies under the radar compared to its neighbors to the north and south. And, while it is a lesser developed beach, it does have its perks, like a prominent jetty, the North Jetty Fish Camp, and twice-weekly drum circles – Wednesday and Saturday nights (take that Siesta!) I find this shoreline to be a bit more shell-studded than most, so bare feet beware. If its name gives you California vibes, you won’t be disappointed. From the iconic, sky high palm trees lining the downtown streets, to that sky blue lifeguard stand, Venice Beach definitely reminds me of Cali. Walk south to Sharky’s on the Pier and absolutely walk the pier. Okay, so it can’t compare to the one in Santa Monica, but it’s still a must-do. By then, you’ll be hungry, and Sharky’s also won’t disappoint. Have a dog? Beyond the pier, your four-legged fur baby can enjoy the beach, too! Caspersen is probably my favorite Gulf Coast beach for two reasons: 1. black-ish sand; and 2. a complete lack of hotels and resorts. With my penchant for wandering, I prefer a secluded beach, and this one is certainly that. Undeveloped beaches are a rarity for sure, so if you’re looking for an unspoiled, Old Florida feel, you’ll find it here. Another of my favorites, Manasota is the best for shark tooth and sea glass hunting. In general, Venice beaches have a higher concentration of shark teeth, and here, you can literally pick them off the sand! This is also the only beach where I regularly find sea glass (an average of one per visit). 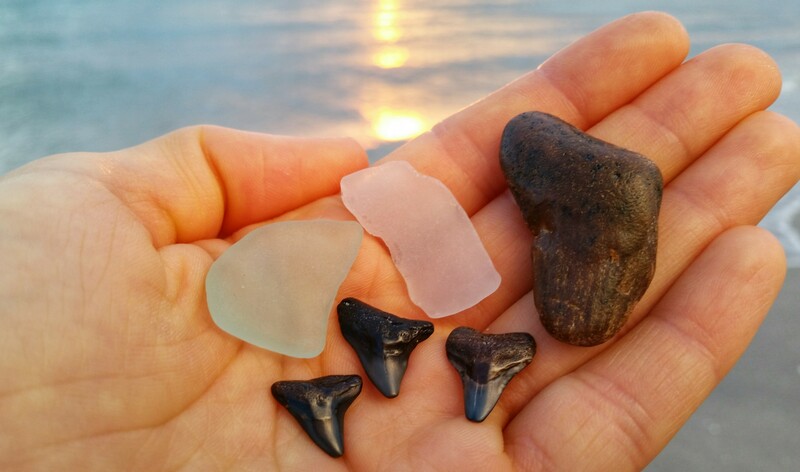 Walk from Manasota back to Caspersen, and you’re sure to leave with a handful of shark teeth and (fingers crossed) at least one piece of sea glass! I’ve not been so lucky with shark teeth at Englewood, but this beach otherwise has a similar feel to Manasota. Though there is a nominal parking fee and slightly more beachgoers, you can avoid the crowds by venturing away from the main beach access point. 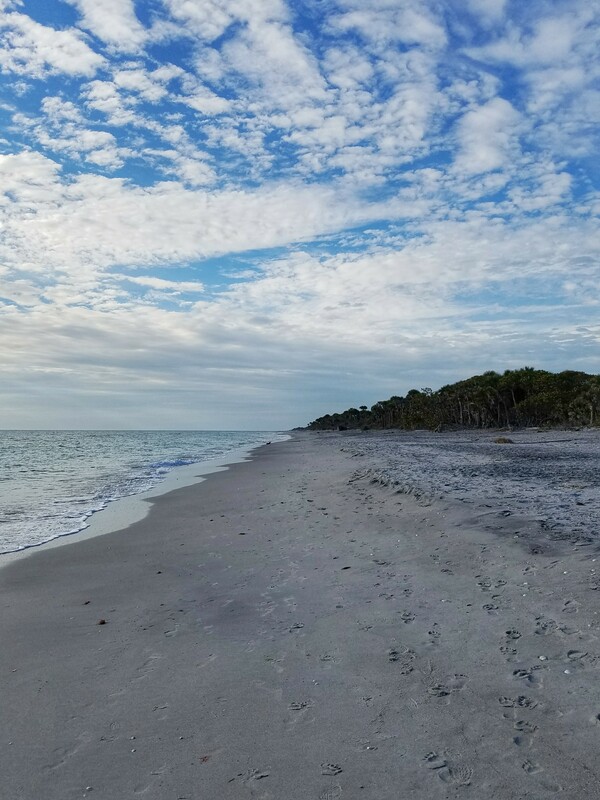 Overall, the beaches along Manasota Key – Caspersen, Manasota, and Englewood – are quite walkable, if beach lounging isn’t your thing. And, if you walk all the way from Englewood to Caspersen (I’ve done it!) you’ll earn major respect points from me. The last beach on Manasota Key, this is the only one where parking isn’t free – but only because of its state park designation. The fee? $3. And bring cash! But, it’s $3 well spent to see the sprawling forest of dead trees along the shoreline. It’s a good mile trek from the parking lot to the trees, but oh so worth the walk. Unfortunately, the park closes at sunset, so spending golden hour by the trees is a challenge unless you don’t mind hoofing it back to your car for closing time. Last on my list, this state park comes complete with a lighthouse – the Port Boca Grande Lighthouse, to be exact. Albeit, it’s not your typical towering, cylindrical structure, but, built in 1890, it does possess that Old Florida charm. There’s also a museum inside for all you history buffs. With all this island has to offer – lighthouse, plus views of the Gulf and Charlotte Harbor – this beach makes that $3 parking fee seem free. And, there you have it. My super long listicle guide to aaaaalllll the beaches from Tampa Bay to Charlotte Harbor. Have you visited any of the above? Or, does this make you want to? John and my favorite spring destination is AMI! Every year you can find me walking the beach right around Bean Point. Sounds like your decision to leave the mitten was the right one for you! You come to AMI?? Let me know next time you’re here! I’d love to see you!! AMI is 40 minutes from me!